The ongoing repaving of Freret Street will reduce traffic to one lane and prohibit parking down the commercial corridor for most of the next month, officials said as the work begins Monday. The entire stretch between Louisiana and Jefferson is being patched and resurfaced, and workers will begin removing asphalt from the commercial section between Napoleon and Jefferson starting Monday, according to a notice from the contractor, Command Construction. 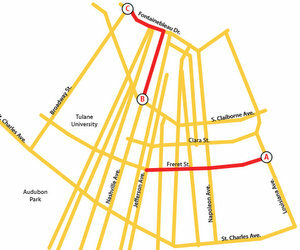 During that time, only one direction of traffic will be allowed on Freret, the notice states. No parking will be allowed on either side of the street or for the first 50 feet of intersecting streets. Improperly parked vehicles will be towed at their owners’ expense. The work was scheduled to begin Monday and continue for three or four weeks, the notice states. In related portions of the project, curb and gutter repairs will continue on Fontainebleau from Broadway to Nashville. On Nashville from South Claiborne to Fontainebleau, crews will finish removing asphalt and begin curb and gutter repairs. The $3.3-million project (part of the larger “Paths to Progress” program to repave major corridors) is funded in part by the Federal Highway Administration.